Here is one of the new products that got me excited, the Space Explorers Camp Kits. While these kits are geared towards use during the summer, I feel from a homeschoolers perspective they would make a great unit study. 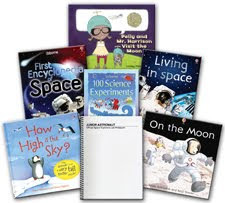 There are three kits, the Junior Astronaut kit is geared towards Pre-K through 1st grade, Discovery Astronaut Camp kit is for 2nd-3rd graders and the Apollo Astronaut Camp kit for 4th through 6th graders. Each kit is $80.00 and comes with five books and an official camp notebook, note that the Apollo kit comes with six books. There are eight missions which take about three hours to complete. These can be completed once a week or dragged out for a week. With a focus on physics students will engage in reading, writing and drawing while following the 5 E's of the learning cycle. They will be engaged, explore, elaborate, explain and evaluate. This is all done through Usborne Books and More and experiments. The notebook has pages for recording the students findings as the work through each mission. 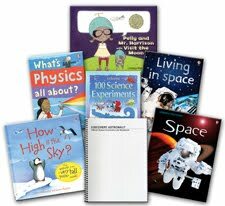 This program has various up points, it is simply and easy to implement, various books are internet linked allowing the student to explore topics of interest in more depth and can be used with multiple age/grade levels. You can purchase mulitple kits at discounted prices, for instance purchase Junior and Discovery kits for $115.00. You can also purchase additional notebooks for $15.00 which would be great if you wanted to use the program for co-op. 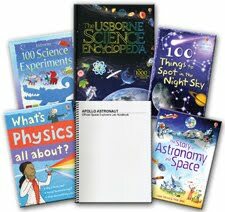 You can view the overview along with samples here and scroll down to Usborne Books and More. These are PDFs and I have not figured out how to attach them here, if it is possible at all. We are BOOK LOVERS over here too! Thanks for sharing a NOBH! How neat! We are going to explore Space in September. Will have to look these up!